See an attached image. If you change tabs, breadcrumbs bar moves down. The cause is that changing tabs invokes Behaviour.apply(document) in main/resources/hudson/plugins/analysis/views/TabDetail/index.jelly(8). There is no need to update core version. using <l:yui> loads proper version of tree-view.js for Jenkins core. it seems that utilities.js 2.9 is compatible with YUI 2.5.2. 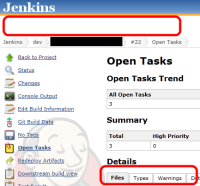 OHTAKE Tomohiro added a comment - 2012-06-14 01:41 I have tested YUI 2.9 with Jenkins core 1.409 and found no problems. There is no need to update core version. Since tree-view.js is bundled with core, using <l:yui> loads proper version of tree-view.js for Jenkins core. Though utilities.js is not bundled with core, it seems that utilities.js 2.9 is compatible with YUI 2.5.2. I will close https://github.com/jenkinsci/analysis-pom-plugin/pull/1 , and will update https://github.com/jenkinsci/analysis-core-plugin/pull/7 . [FIXED JENKINS-13532] Upgrade to YUI 2.9.